← Frozen Yogurt: Good Replacement for Ice Cream in a Diet? There is proof that eggs should be the first thing you eat every morning in order to be skinny. There were a few studies on having eggs first thing in the morning. One study published in the Journal of the American College of Nutrition determined that an egg the first thing each morning could help with limiting calorie intake throughout the day. The study reported that leucine, an essential amino acid that is found in high quality protein such as eggs, can give a weight loss advantage when dieting by helping to decrease loss of lean tissue, increase loss of body fat, as well as stabilize blood glucose levels. If you eat 6 low-carb, protein meals per day, as part of the Skinny Rules, you should start your day with eggs. Until you reach maintenance, and you are still losing, stick to one egg in the morning or two egg whites, scrambled, omelette, etc. I put spinach and mushrooms in mine. I also get hard-boiled eggs and always have them available to pop in my mouth, if I am running out the door, with no time to cook. 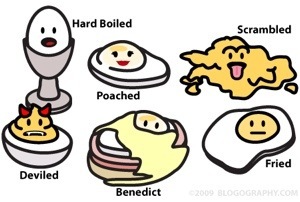 There are many different ways to prepare eggs. frittata, scrambled, over easy or hard, omelette, and even deviled eggs. Here is the recipe for low-carb, delish devils eggs, poached, etc. You can double the amount of egg if you use egg whites. These are also sold, ready to our from cartons. I just found a recipe for low carb egg muffins. They look fantastic and I hope to make them soon. If anyone beats me to it, tell me what you think.